Philomine Lakota combed the open prairie, gathering eagle feathers to present to the young men and women of Red Cloud Indian School’s Class of 2016. 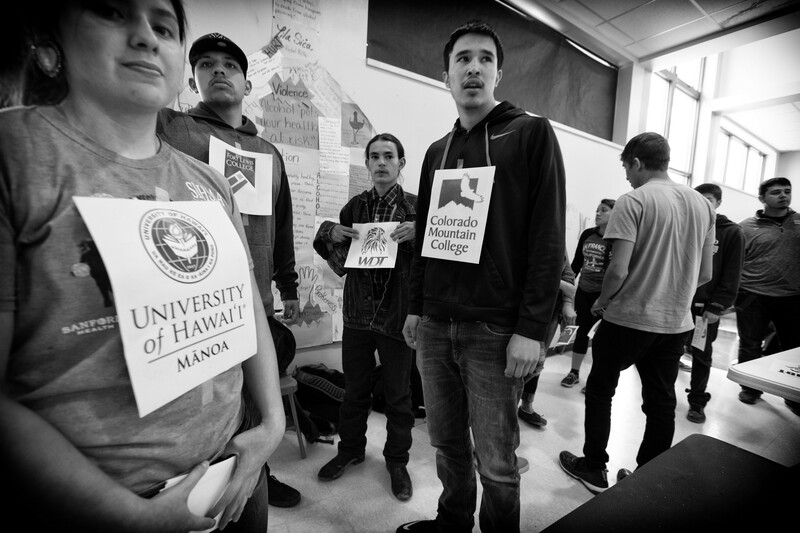 The majority of the seniors would be leaving Pine Ridge in the fall for college and, for most, it would be their first time living off the reservation. “The eagle is the only bird that can fly so high — it looks as though it can fly as high as the sun,” says Lakota, 68, who has worked for more than a decade to revive the Lakota language. It is an apt metaphor for the graduates, most of who had had to overcome big obstacles just to graduate. Justin Mesteth, her star pupil had faced, and overcome, some of the biggest. He starts at Wesleyan University in Connecticut this fall. 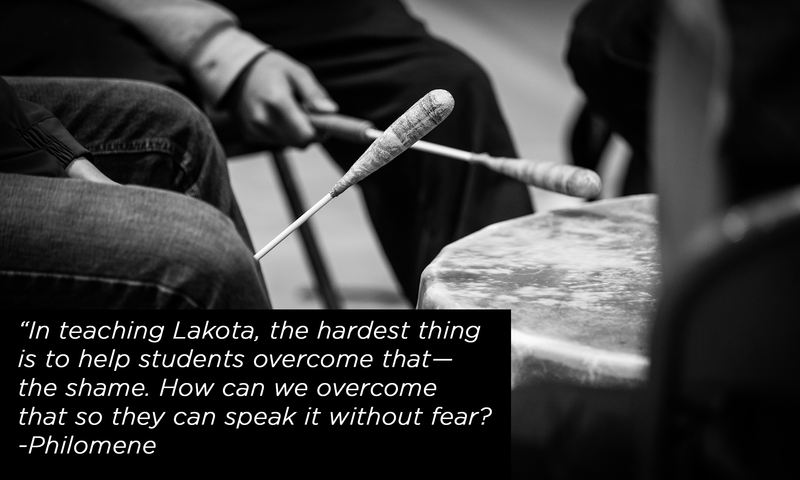 Lakota developed and teaches the Native language curriculum at Red Cloud, a Jesuit school on South Dakota’s Pine Ridge Indian Reservation. Students learn about Catholicism as well as their cultural heritage and are required to study the Lakota language, one of the three Sioux dialects, for three years in high school. Families pay just $100 in annual tuition; the rest is covered by charitable donations, and many of the school’s teachers are volunteers on service missions. 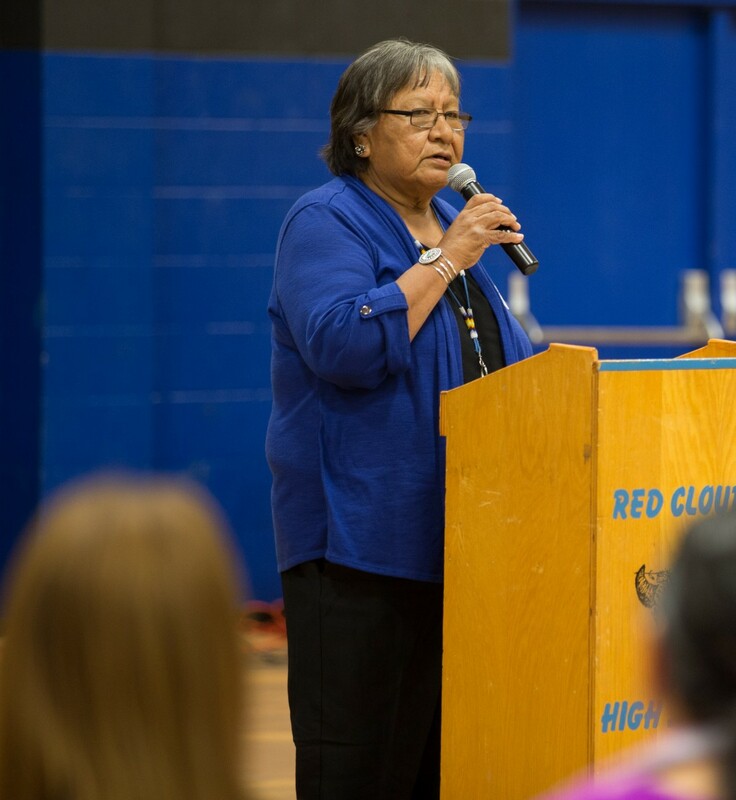 Virtually every graduate of Red Cloud goes on to college which, over time, should increase the percentage of adults on the reservation who have a bachelor’s degree. To make sure that happens, the school provides counseling and other services to help them cope with issues such as family alcoholism, mental illness, and trauma. Philomine Lakota explains that the eagle feathers are traditionally given to recognize a major accomplishment; for the graduating seniors, they will also serve as a reminder of who they are and where they come from. For many generations, the Oglala Lakota had been alienated from their language and culture even on their own reservation, through systematic repression and forced assimilation by the government and churches. Beginning in the late 19th century, Native American children were sent to boarding schools where they were allowed to speak only English, and were shamed and punished for lapses into Lakota or for expressing their religious beliefs. These schools were run according to the mandate “kill the Indian and save the man,” a doctrine attributed to General Richard Henry Pratt. At their peak in the 1970s, these schools enrolled more than 60,000 students. In the wake of investigations revealing rampant physical, sexual and mental abuse of Indian boarding school students, many tribes formed community-based schools, and most of the boarding schools closed. Still, today, many people on Pine Ridge refer to “the intergenerational trauma” linked to boarding schools and cultural suppression as a factor in the sky-high rates of alcoholism and substance abuse, as well youth suicides. Philomine Lakota was among the last students to attend the boarding schools. She recalls teachers washing her mouth out with soap for speaking her Native Indian language. “I rinsed my mouth out but it felt like it was burning my brain,” she says. In 1982, Lakota says she felt a spiritual calling to bring back the language and traditional rites of passage for the young people in her tribe, a task that took her 10 years because she had to research and relearn them. In doing so, she overcame her own internal struggle between what she had been taught in school and what she still knew in her heart, from knowledge passed down from elders in her tribe. Today, Lakota teaches the Native language to students across the reservation and they also take part in a host of cultural experiences, including sweat lodges, vision quests, sun dances and pow wows. This year, the students at Red Cloud participated in a buffalo kill — the first Philomine Lakota had ever experienced. Justin Mesteth was one of the leaders and helped butcher the animal. Justin Mesteth is contributing to that renaissance. This was Part IV of IV.